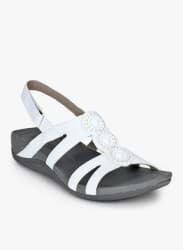 Walk around in style and comfort by wearing this pair of white sandals from Clarks. These slip-ons, made from leather upper and rubber sole are high on both comfort and durability. Featuring strappy upper with velcro closure, this pair will go well with T-shirt and denims.